Loved the size of the apartment and the views to die for!! A little bit far away from everything but we knew that going in. The climb back up was only done by cab ... worth the $8-10 fare. Very peaceful and tranquil. Amazing corner 2 bedroom unit with great spacious balcony. Very private from other units. Fabulous accommodations with a few hick-ups. Power breaker flipped a few times and our dryer was not functioning. Beach towels were not available to rent as stated in their booklet. A few more bath towels would have been wonderful instead of the one each for a six night stay. Dryer wasn’t functioning so made for a long dry of the towels on the rack. Easter long weekend so reception staff not available for assistance. Would definitely stay again! The ABH had just reopened after being restored from cyclone Debbie damage and was fresh clean and tidy. The room we had, self contained suite was perfect for us, spacious and had a view over the bay. The only thing I can fault is that the in room dossier still had a room service menu and we planned on that only to find they no longer offered room service. But everything else was great and would highly recommend its great value. 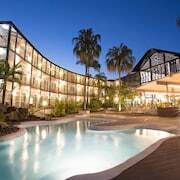 Where to find Airlie Beach hotels near an airport? Where can I find hotels in Airlie Beach that are near tourist attractions? If you are deciding on where to spend the night while vacationing in Airlie Beach, you will find a great assortment of comfortable possibilities. Spend some time looking through Expedia's 58 accommodation options, which are all within a 0.1-kilometre (0.06-mile) radius of Airlie Beach's city center. 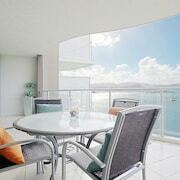 One of the keys to stress-free travel is finding a hotel that's close to the action, so why not check out the latest offers at the Mantra Boathouse Apartments and Peppers Airlie Beach, which are located a short distance of Airlie Beach's downtown area. Cannonvale is a neighborhood that is 3 kilometres (2 miles) from the middle of Airlie Beach and has 9 hotels you can book through us. 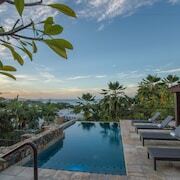 Places to stay here include the Paradise Court and Sailz Boutique Holiday Villas. While staying in the Shute Harbour part of Airlie Beach, some of the places to stay include the Coral Point Lodge and Baybliss Apartments. Shute Harbour is 8 kilometres (5 miles) from the heart of Airlie Beach. Jubilee Pocket, roughly 2 kilometres (1 mile) from the heart of Airlie Beach where you'll find Island Gateway Holiday Park and Best Western Mango House Resort. 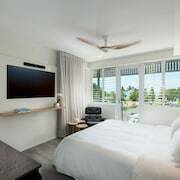 If you are a budget traveler and are looking for more affordable Airlie Beach hotels or apartments, our hotel database also has affordable lodgings to choose from in the area. The Shingley Beach Resort is 1 kilometre (1 mile) from downtown, while the Coral Point Lodge is 8 kilometres (5 miles) away. The Colonial Palms Motor Inn and the at Boathaven Spa Resort are another two lower priced options that you could look into. The Beach Club is situated 25 kilometres (16 miles) away from downtown Airlie Beach. Another option is the Peninsula Airlie Beach, which is located 1 kilometre (1 mile) away. Another option is to make a reservation at the Reef View Hotel or the Palm Bungalows. Why not see some more of the beaches, rainforest and streams that are commonly found in in Whitsunday Coast? Choose to spend time in other parts of Whitsunday Coast. You can travel to local various sights or have a go at hiking, shore fishing and beach combing and then book a comfortable hotel. 95 kilometres (60 miles) to the southeast of Airlie Beach is Cannonvale, where you'll find the Hibiscus Shopping Centre. Bucasia accommodations include the Comfort Resort Blue Pacific and Dolphin Heads Resort. Alternatively, you'll find Cannonvale, 3 kilometres (2 miles) to the west of Airlie Beach. In Cannonvale, visit the Cannonvale Beach. The Pinnacles Resort and Coral Sea Resort are all good places to lay your head. Great Barrier Reef Airport is a logical airport, and is located 25 kilometres (16 miles) away from Airlie Beach. 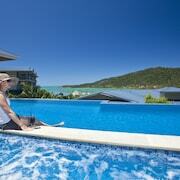 Nearby hotels are Whitsunday Apartments and Hamilton Island Holiday Homes. What are the most popular Airlie Beach hotels? 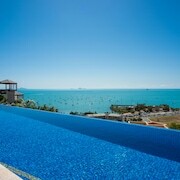 Are there hotels in other cities near Airlie Beach? 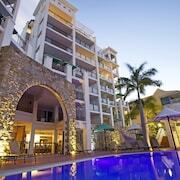 What other types of accommodations are available in Airlie Beach? Explore Airlie Beach with Expedia.ca’s Travel Guides to find the best flights, cars, holiday packages and more!